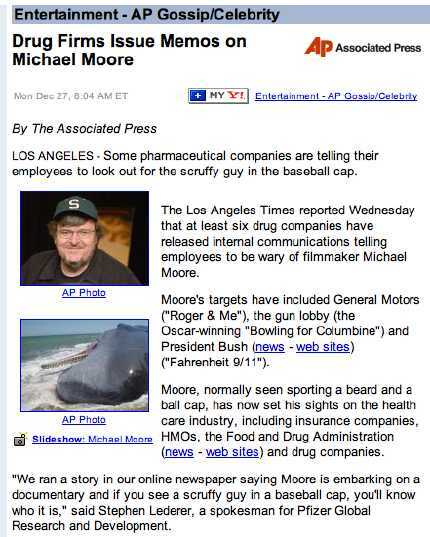 It could be that our long national nightmare is coming to a close, and that the media's love affair with Michael ("Mr. Peepers") Moore is on the wane. Clicking on the whale image in the story brings up a larger picture with the caption: "This undated image issued by Michael Moore of the Woods Hole Oceanographic Institution in Massachusetts, Thursday, Dec. 23, 2004 shows a sperm whale." We can assume that the only Woods Hole filmaker Moore is familiar with is his own or those of unfortunate acolytes. All the same, it says something about the random nature of news in an online age. In the future, this may be seen as the moment when Moore's fortunes began to turn and he was forced to pursue a career as the Global Ambassador for Krispy Kremes. Kudos to Ole Eichhorn of the invaluable Critical Section for making this catch.